From time to time I hear of paranormal groups that start up locally. When I can I try to get information on them so we are aware who is in the area so when asked we can report that there is a group and they might be called upon to investigate. Well there is a new group Girls/Guys Paranormal Investigation. GGPI is a Wyoming based paranormal group, made up of 6 members Paula Birrell, Hally Tomich, Dustin “Duds” Owens, Stan Tomich, Zack Owens, Josh Dillard, and Devin Shinkle and some guest investigators. They are a Non-Profit group set out to help people in need of their services. In hopes to help find out what really goes bump in the night. Sometimes it’s paranormal sometimes it’s not. If you have questions or would like their help feel free to contact them. GGPI have done investigations in Rock Springs, Green River, Bryan, and Stanley Hotel in Estes Park, Colorado. They are a young group and have only been in existence for two years. Gradually members have been added and the team is developing. 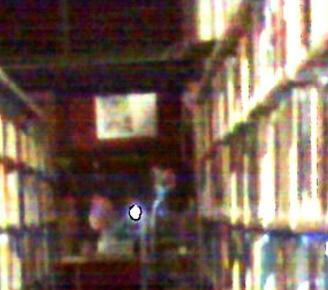 During our last October Ghost Walk, one participant Paul came forward and said she had captured a full apparition in the stacks. We were very excited and asked if she would share the photo with us. She said she would but for some time we lost track of each other. Just recently she stopped in and shared the website for their group and said the photo was listed there. I have seen several pictures taken by others that I was not clear what they were seeing. This photo however is clear to me. I have heard stories of staff and patrons seeing the “man in the top hat” for a few years now. I have never seen him myself. All I can say is WOW. 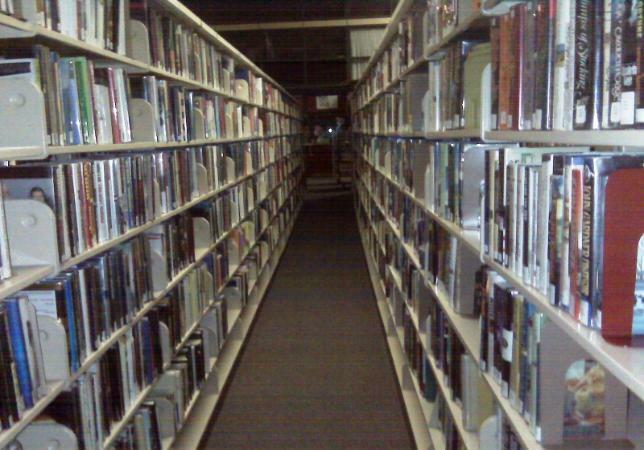 Paula Birrell took this photo after having a strange feeling and looked down the stacks and saw a dark shadow. This is the best photo we have received to date. If there are others out there we have not seen them. Do you see the man to the left? He is just this side of the bright reflection. He is in dark suit, white dress shirt, and top hat. Special thanks to Paula Birrell for sharing her photo with me. Recently I was flipping through channels one night trying to find something to watch on television and I ran across a show called “Psychic Kids: Children of the paranormal”. I am always looking for a new paranormal show so I stopped and watched. The premise of the show is two adults that are professional psychics; take two or three young people and their parents to a psychic weekend get-away. Generally it seems many of the young people are having difficulties as you might have guessed dealing with their special connections. Many families and friends do not understand what it is they are going through and it has taken a hard toll on their young lives. Although they did not ask for their gifts they try their best to deal with what they see, hear, feel, etc. It is very hard on them. The psychic adults that are doing the “workshops” seem very kind and understanding. As they phrase it “We have been there and we know what it is like”. And they do seem to try to teach the young people how to take control and get their lives back. Unfortunately if is sometimes hard and it does take time. They are given steps and tools to work with. After time things do seem better, not always totally ok, but at least they are providing hope for someone that otherwise would seem lost. In some ways as a mother I found it disturbing to see how scared and distraught the kids were and how hopeless their parents seemed. As a parent s, when you hear a child say they talked to someone many of us have assumed that they have an imaginary friend and we dismiss it. Well…maybe we should not always dismiss it so quickly. If you watch a few of the episodes you will see just what some of the children are dealing with. Some of it is very intense. After watching one episode I am hooked. I now try to catch new episodes whenever I can. I have learned a lot from just the few I have watched. If you have a child that is having similar difficulties or you have gifts of your own and need help you might contact the experts on the website for assistance. Or if you are interested in watching please visit A & E Television or the website below.